Wimbledon is in full swing. The British Grand Prix roared around Silverstone. The Tour de France is underway. And, of course, the Football World Cup reached the Quarter Final stage and football is still thinking of coming home. Of which, more later. But the most important event, by a country mile, was not the tennis, nor the motor racing, nor the cycling, and not even the footie. It was chequers. On Friday, the Prime Minister locked her cabinet into a manor house in Buckinghamshire, confiscated their mobile phones, handed out the phone number of a local mini-cab company in case they were tempted to resign from Government and thrashed our a united position on Brexit. At last. I have argued in these pages before that we needed to get on with the real job of negotiating a post Brexit deal with the EU. We had vacillated for too long, perhaps out of political necessity. But we had run the clock down dangerously close the Brexit midnight and into the vacuum of no agreement had marched a thousand interpretations, vested interests and confusions. Now, at long last, collective cabinet responsibility has been restored. Now, at long last, we can get on with locking horns with Barnier and Co.
Now, at long last, we have a chance of securing a Brexit that is good for Scotland and the best we could reasonably get for Britain. It will not be easy. It will not please everyone. In fact, a measure of its success will be if it infuriates people at the extremes of the debate. If, as is the case, both Nick Clegg and Nigel Farage are hacked off at the Chequers accord, then maybe we are heading in the right direction. The most meaningful measure of its chances of success is whether it can unite the more reasonable but previously disparate voices on either side of the Brexit divide. There will be some, for personal or Party political reasons who will never give three cheers to any UK government line. For some, the hope of triggering a General Election or another constitutional row will be all that matters. For them, any Conservative Cabinet line can never be good enough. But many are starting to realise that we are where we are. We voted to Leave, which means things can’t stay the same. We don’t live in a perfect world which means we can’t always get everything we wish for. We were never going to be able to have our cake and eat it, which means compromise. Above all it means we have to live in the real world, with common sense and consensus being the order of the day. It means making the most, and best, of the cards which have been dealt. It means it is time to stop playing games of “victor or victim” and for the EU to get real too. No deal is not in their interests or ours. No deal would hurt them as much as us. No deal is not good for German cars, or Danish bacon, or French cheese. This week, we will get a better feel for how the land lies with important debates and votes on the trade bill at Westminster. And then we will know if it is the House of Common Sense. This week also sees Donald Trump visit our shores. My regular reader will know that I could hardly be described as his greatest fan. Indeed, I couldn’t be described as a fan at all. He scares me witless. Or something which rhymes. But he is the President of the United States of America. As such, he is but a temporary incumbent of the Oval Office. And the country he represents and the people he serves and the position he holds are far more important than him. I doubt he would agree, but tough. It’s true. So of course he should come. And of course, if people wish to, they should protest. And if that includes a giant floating baby Trump, then so be it. Is it childish, in your face, potentially offensive and attention grabbing? And so is the inflatable. So whilst he is here let’s use the time well. Let’s work on a new post Brexit trade deal. Let’s tell some home truths about his policies. Let’s expose the folly of his trade war. Let’s stand up to his bullying and hectoring. Because I suspect that is the best way of handling him. Face to face. Straight talking. Unflinching and resolute. You face bullies down, you don’t turn the other cheek. 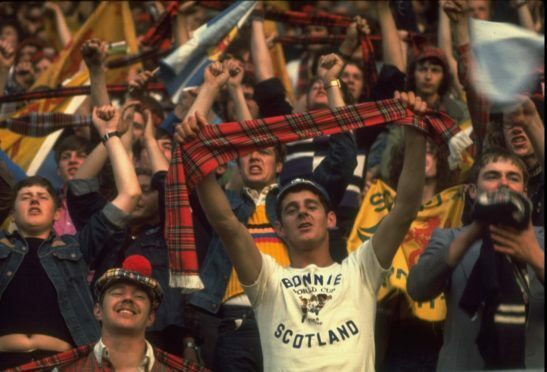 In this World Cup, as in too many before, I haven’t had the luxury of supporting Scotland. And in this World Cup, more than ever before, I’m backing England. I’m not entirely sure why. It may be just this particular team of hard working, decent footballers. A side without pretentiousness or primma donnas. Led by a really nice bloke. But I also think it is because I have grown up and grown tired of the Anyone But England brigade. Those boorish types who define their Scottishness by being anti- England. Who pretend that it’s the overbearing English media and commentary that turn them against Southgate’s side. Who are fed up of the team’s success being all over the news. Who cover their ears every time Three Lions is played. Who can’t stand all the English jingoism. Who would rather back Putin’s Russia on Wednesday…..
Well get a grip, guys. And get a life. It’s only football. If you can’t feel pleased for your nearest neighbour, then I despair. If you think that we wouldn’t crow as much if it was Scotland doing well, then think again. If you want to live your life in envy, then you are welcome to it. And if you think it is ok to define your life by flying the Saltire but hate others for loving the Cross of St. George, then it’s you that has a problem. So I say three cheers for the three lions. And I say to football: come on home.